Read about - Gobblegutz Cafe below. Gobblegutz Cafe can be found at the Hallidays Point Shopping Centre, High Street, Hallidays Point. They serve great coffee and a selection of tea - all presented beautifully. Seating is provided outside the Cafe with the added touch of knitted throws to put over your knees on a cold day (there are some seats available inside but most patrons prefer to be in the courtyard of the shopping centre). 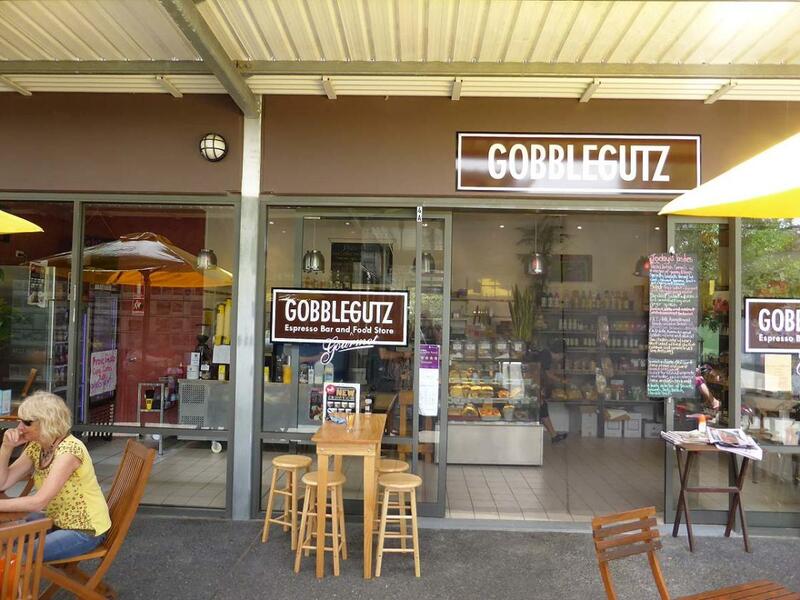 Gobblegutz also serve light meals and has a selection of food items such as chocolates, marinades, pasta, boutiique tea, and unusual gifts - things that are sometimes hard to find in the country. Gobblegutz is a very popular meeting place - word has spread about the great coffee and friendly service. Lemon infused water is available free of charge to all patrons - my husband always looks for a glass of water after enjoying his coffee. have you been to Gobblegutz Cafe? Explore Gobblegutz Cafe - Black Head with RvTrips and find out where to stay, what to do and what to see. Helping caravan, motorhome and camper owners have a great holiday.